Posted: December 10, 2012 by Jackie R.
…hopefully a name that doesn’t impose fear upon those who hear it. Unfortunately, this beautiful animal is misunderstood by some members of the public. However, my exposure to this species has been nothing but positive. When I think of black bears, images of past experiences spring into my head, which always leave me with a reminiscing smile. My first black bear sighting occurred when I was only eight. My family and I were travelling to a pond to catch some sunfish, when we saw a huge jet black creature disrupting the green environment. Along the road a sow and her four cubs were feasting on ants, which were scattered throughout an overturned rock. When I was hiking two summers ago, I stumbled upon a beautiful mature black bear. Its back was facing me, so I froze and hunkered down low. After I sat on the ground, the bear turned around and spotted me. However, instead of fleeing, the bear laid on the ground. From a distance of no more than 30 yards, we both relaxed and stared at each other; a moment that will forever be etched in my mind. I took this photo right before the bear laid down to engage in a staring contest. This July my family and I happened upon a sow and two cubs. 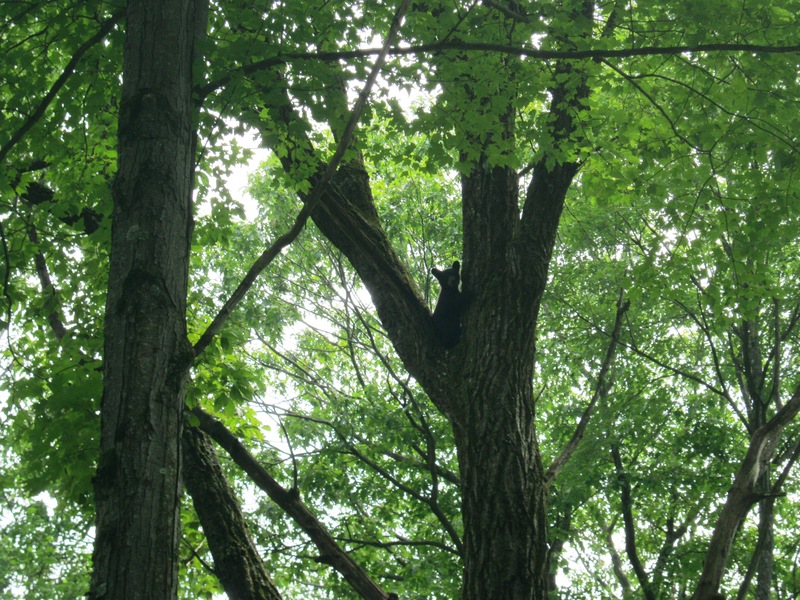 Instead of retreating with its family, one of the cubs climbed a tall oak. This was the first time I witnessed a bear in a tree, and this cub had no difficulty navigating up the bark. It stayed in the crotch of the tree for a while, as we stood in awe, savoring the moment for as long as we could. To help them climb, cubs are very agile and have sharp claws. 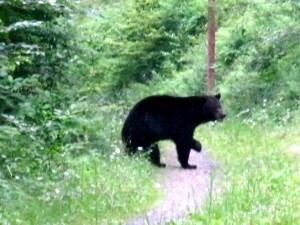 I have other various experiences with bears, which is one of the many benefits of owning property in north-central PA. The American Black Bear has added excitement to my outdoor adventures and I encourage everyone to take a hike in the northwoods. You may be surprised by what you see, and through observation comes appreciation.